Bayesian consensus phylogeny of Alcedinidae genera from nuclear (RAG-1) and mtDNA (ND2) sequence data (Moyle, 2006). Different relationships amongst reciprocally monophyletic subfamilies (Aledininae, Cerylinae, and Daceloninae) are found from morphological (Maurer and Raikow, 1981), DNA-DNA hybridization (Sibley and Ahlquist, 1990), and nuclear DNA sequence (Johansson and Ericson, 2003) data. Johansson, U. S., and P. G. P. Ericson. 2003. Molecular support for a sister group relationship between Pici and Galbulae (Piciformes sensu Wetmore 1960). Journal of Avian Biology 34: 185-197. Marks, B. D., and D. E. Willard. 2005. Phylogenetic relationships of the Madagascar pygmy kingfisher (Ispidina madagariensis). Auk 122: 1271-1280. Maurer, D., and R. J. Raikow. 1981. Appendicular myology, phylogeny, and classification of the avian order Coraciiformes (including Trogoniformes). Annals of the Carnegie Museum of Natural History 50: 417-434. Moyle, R. G. 2006. 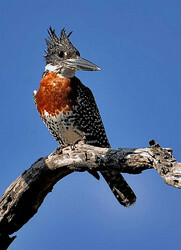 A molecular phylogeny of kingfishers (Aledinidae) with insights into early biogeographic history. Auk 123: 487-499. Moyle, R. G., J. Fuchs, E. Pasquet, and B. D. Marks. 2007. 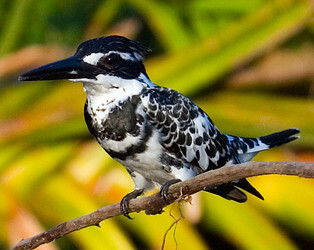 Feeding behavior, toe count, and the phylogenetic relationships among alcedinine kingfishers (Alcedininae). Journal of Avian Biology 38(3):317–326. Sibley, C. G. and J. E. Ahlquist. 1990. Phylogeny and classification of birds: a study in molecular evolution. Yale University Press, New Haven. Woodall, P. F. 2004. Family Alcedinidae. Pp 130-249 in del Hoyo, J., A. Elliott, J. Sargatal (eds. ), Handbook of the Birds of the Worl, vol. 6. mousebirds to hornbills. Lynx Edicions, Barcelona. Page: Tree of Life Alcedinidae. 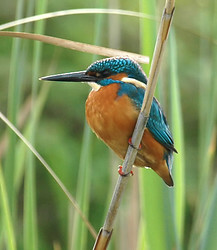 Kingfishers. The TEXT of this page is licensed under the Creative Commons Attribution-NonCommercial License - Version 3.0. Note that images and other media featured on this page are each governed by their own license, and they may or may not be available for reuse. Click on an image or a media link to access the media data window, which provides the relevant licensing information. For the general terms and conditions of ToL material reuse and redistribution, please see the Tree of Life Copyright Policies.